← My first post… here we go. Here’s Gracie saying hello to Sweet Pea, the mare she rides in Melbourne, Florida. 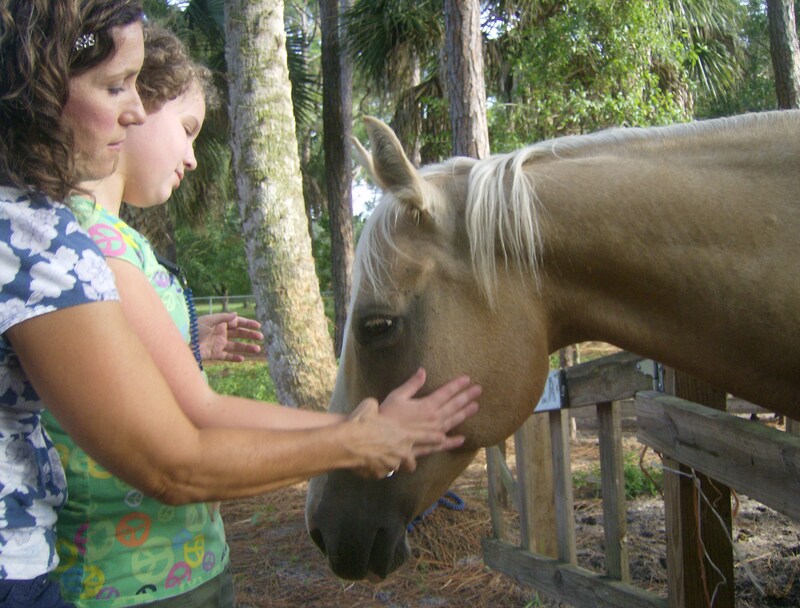 A special thank you goes out to our friends Joellen and Eric Mullins in Ohio, who introduced Gracie to equine therapy. By the way, guys, Gabrielle now rides with her sister! On another horse, though. The only downside is that they ride around dusk, when the skeeters come out. They seem to love Gracie, unfortunately. Then she scratches at her bites until she’s bleeding all over the place. Jeez. So now we dress her in long pants and sleeves, and break out the Off!. FYI, for any of you who might have similar issues with your children scratching their sores, New-Skin does the trick! See http://newskinproducts.com/. Sweet Pea is very cute and Gracie looks like she loves her! Yes, we think Gracie loves riding. I remember her being so excited when we would come down to visit you guys for her riding lessons. Glad you’re checking out our blog. You and Eric need to come on down again!